A chess set consists of 32 chess pieces, including 16 pawns, 4 Rooks, 4 Knights, 4 Bishops, 2 Queens and 2 Kings. Chess pieces has made from some material, such as; plastic, wood, glass, metal, and acrilyc. But the most popular and qualified is wooden chess set that made from Teak wood. It because the teak wood is resistant to all kinds of weather, so that this wood is highly prized by lovers and collectors of furniture the world over. 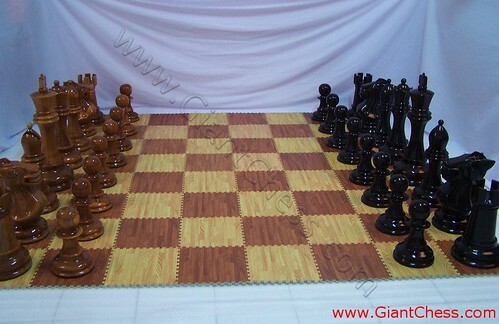 In the picture above, we present you 24 inch chess set that made from original Teak wood. 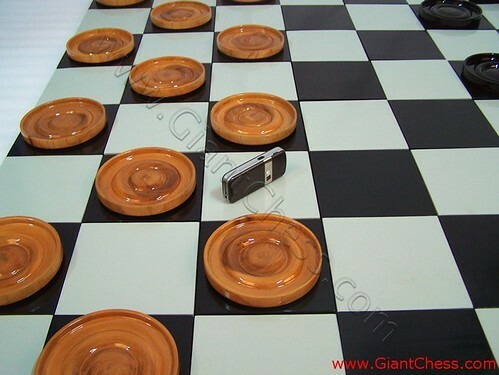 Our 24″ chess set is very popular for outdoor use, on a board with 12″ x 12″ squares. Children and adolescents especially love these pieces, and they are still not too large, nor too heavy, to be taken with you wherever you should wish to play. Even if kept permanently outdoors, in yard or garden, because they are of teak they can withstand any weather. 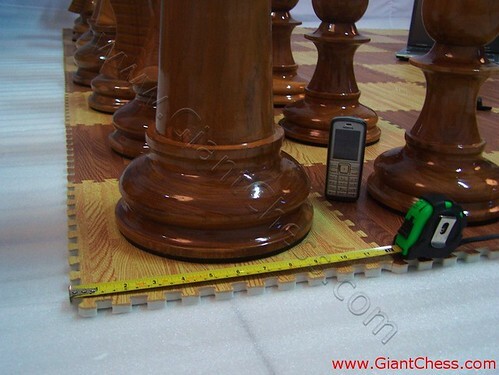 We are specialized in giant chess products. We have talented craftsman who always have new idea about chess pieces. We have design and manufacture high quality chess sets and chess accessories, specializing in large-to-giant pieces (with beautifully coordinated boards and tables) that are prized by players of all ages, collectors, decorators, and lovers of fine art the world over. Our products are made of the finest materials, especially original Indonesian teak, prized for its strength, the beauty of its grain, and because it is highly suited to finely engraved sculpting. Our company is currently setting the standard to which all other companies that produce chess products aspire, and our exclusive products are known and treasured by people the world over. It is, in large measure, because we use original Teak wood from Indonesia, taken from Perhutani, the legal forestation department in Indonesia, that assures high quality. Many people buy the table to display beautiful chess sets. Otherwise, another people has different reason to buy chess table. The reason is because they want a good looking table to analyze chess game. From the reason above, we can conclude that chess table is a unique table for chess game or house furniture that will make your house feel different and elegant. Here we present wooden chess table that polished well in natural wood color. As usual chess table, our chess table has 32 brown squares and 32 black squares so amount 64 squares. Completed with two drawers, so you can keep your chess pieces there. Our chess table carved by professional craftsman with their experience skills. They are really expert in carving handmade product. You do not need worry about the quality, because our product is made from best Teak wood. So those chess table is very durable and has high quality. A chessboard is square and flat, consisting of 64 squares, 32 black squares and 32 white squares. In order to be secure in shipping we pack our chessboards in specially designed crates . The same care is taken for our chess pieces. GiantChess.com’s chessboards are hand crafted mainly of Indonesia teak. Some of our chess boards and chess tables are specially adapted for the chess pieces that come with them. Here is one kind of our chess board. It is called as folding chess board, the simple and easy board. You can bring it anywhere you want to use it. This chess board is light and you just fold it to carry. Easy to move, easy to save and easy to carry. Made from qualified wood and polished well. Order it now! We have no limit for your order, so you can order in unlimited amount for your business. Chess pieces are unique for decoration use. Those pieces have different form with different titled. Some people use it for decoration need and make it in big size to suit it with the furniture. To decorate the room, you do not need to include a set of chess pieces. 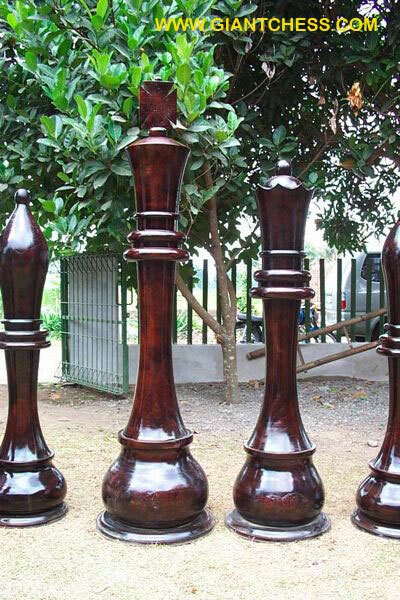 Only one big chess pieces, you can beautify your living room, bedroom, office or your library. You can choose the pieces you like, such as King, Queen, Bishop, Knight, Rook or Pawn. 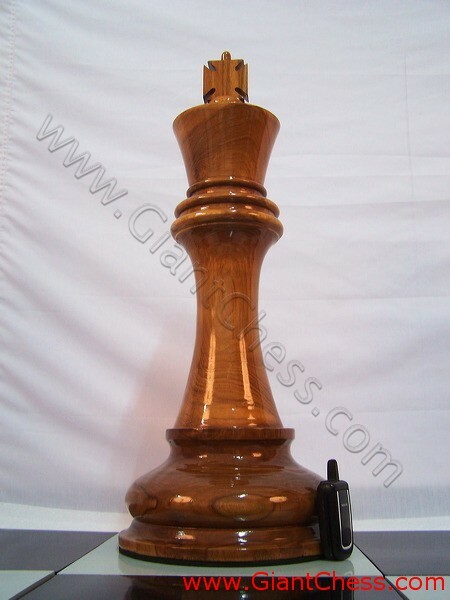 Just like in the picture above, the 24 inch King chess has designed for decoration need. 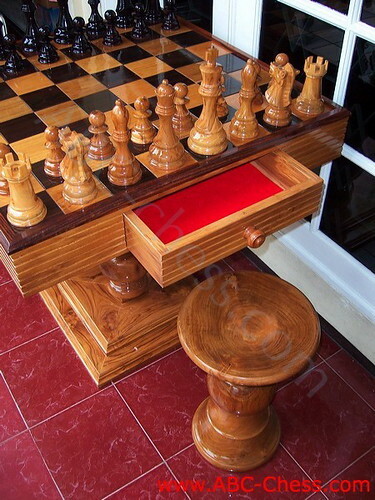 Made of Teak wood and very durable for outdoor also indoor chess game. This King chess piece has carved by talented craftsman and polished well in glossy brown. Perfect for your house decoration, stand together with your house furniture. Chess table is flat table with squares motive on its surface. Chess table usually accompanied with two stools or chairs. The player just sit on the chair and put the chess pieces on the table, then the game already to start. It easy and simple. Some people use the chess table not only as chess game, but also take a part in their house furniture. The chess table can use for having coffee or tea. People prefer to wooden chess table than other. The wooden chess table is more worthed and more unique with its table part. Just has show in the picture above. It is parts of wooden chess table with two draws. It consists of squares surface, table body and table foot. The table has made from best Teak wood that carved by talented craftsman and polished well in natural brown color. Wooden chess set is unique and interesting for collection. The pieces commonly use as house decoration or put it in living room, library or kids room. But if you want to play chess game using this kind of chess pieces, you may play it outdoor. This chess set need enough flat space to lay them. Sized in 24 inch, will bring different atmosphere to your garden or backyard and give unusual touch for your chess game. 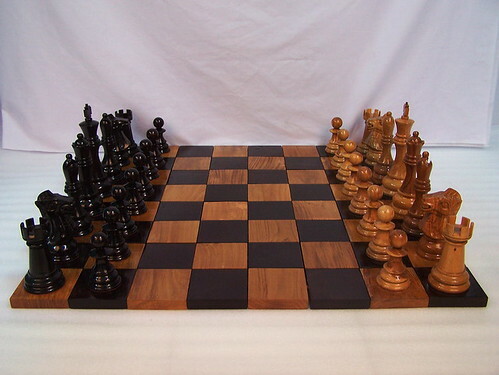 Our 24″ chess set is very popular for outdoor use, on a board with 12″ x 12″ squares. Children and adolescents especially love these pieces, and they are still not too large, nor too heavy, to be taken with you wherever you should wish to play. Even if kept permanently outdoors, in yard or garden, because they are of teak they can withstand any weather. Stone pieces are made from Teak wood material. We have choose the best wood as its main material which has dried before. Known as the strongest wood in the world, the Teak wood has become popular and worthed wood for outdoor furniture or handicrafts. That's why, Teak wood products are always durable for outdoor need in any seasons or weathers. This time we use Indonesia Teak wood for handicraft product called 'Wooden Stone' pieces. The stone pieces are polished in glossy black and carved by our talented craftsman. People and children love this kind of handicraft product. They often use it for garden and backyard decoration, room decoration, put it at patio area, or even use it for souvenir and gifts. The wooden stone pieces are so unique and unusual as wooden products. Otherwise, you can get it in other colors that you want. 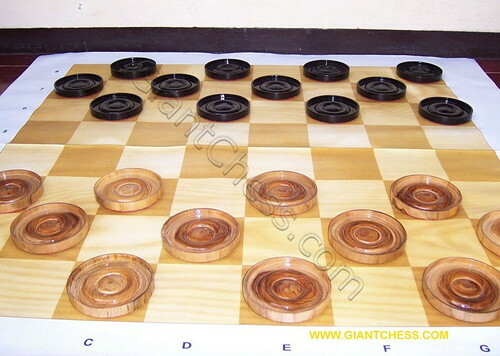 This is the giant chess product which made from Teak wood material. 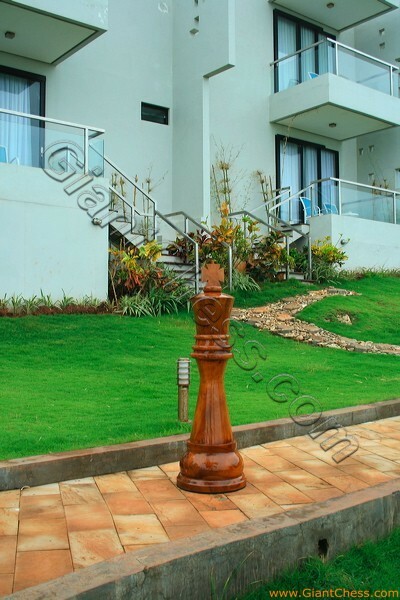 The giant chess piece has carved beautiful by talented craftsman from Indonesia. The result is this funtastic giant chess. Furthermore, it has polished in different color, escape from ordinary chess piece. This time, the giant chess comes in silver performance. A giant King chess which paint in silver looks so elegant and unique. People like to decorate their house with something special and unique. 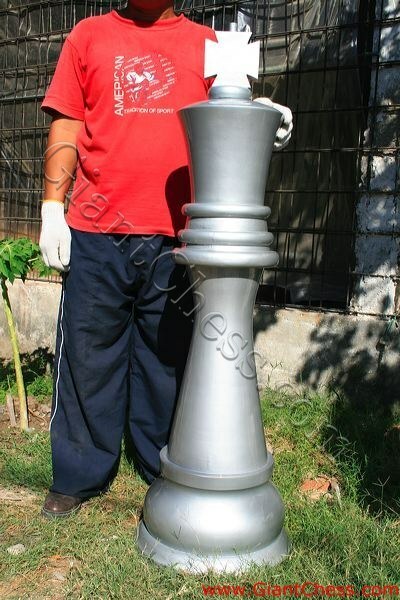 By this giant silver King chess, people can use it for their house decoration. It would be nice to put it at garden, patio area, backyard, library, camp ground, villa, and other interesting corner. The giant silver King chess itself is durable products, so people can left it outdoor for months. All of our chess products are made from best quality of Teak wood. Original from Indonesia Teak plantation. We also have dried the wood to get good wood to carved. 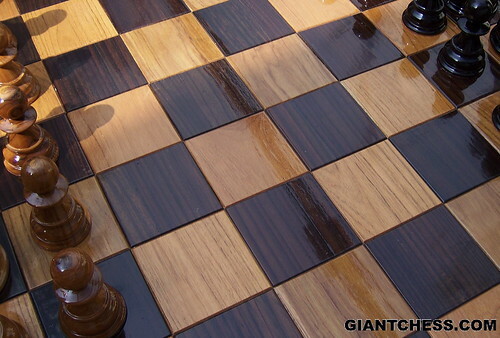 Teak wood has known as the strongest wood in the world and it suit for our outdoor chess products. Our big chess often use for outdoor chess game completed with its chess board. That's why, the Teak wood may become the best choice as our main material. Further, dried Teak wood would carved by our talented craftsman into unique and beautiful chess pieces. It also polished in black and natural brown with glossy touch. Then, the chess pieces has already use for your game. As same as the pieces, the chess board also made from Teak wood and made by craftsman. The board has suited with its chess pieces size, so it make the board more wide than usual. Its squares also divided into black and brown color. To start the game, you just need to arranged the chess pieces on the squares board. Here are the 24 inch chess pieces come to make your chess game more challenging. 24 inch chess set often use for outdoor chess game because those pieces have bigger size than usual chess pieces which used in chess tournament. 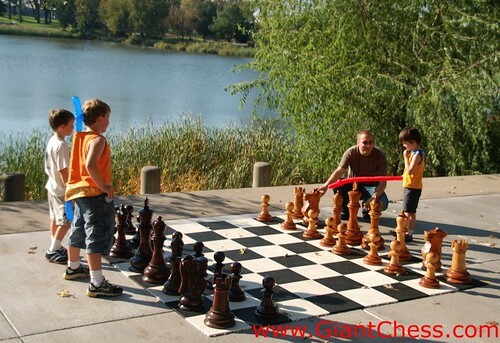 Consider about the size, people prefer outdoor area to play using the 24 inch chess pieces. It should be supported with the suit chess board also. 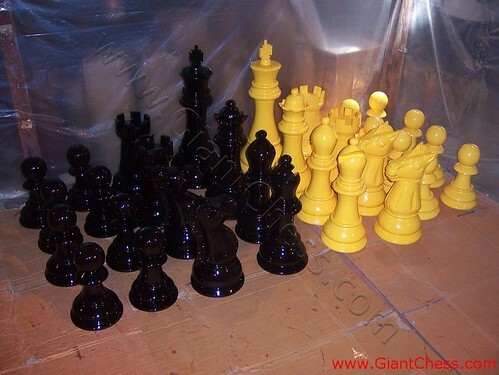 This time, the 24 inch chess pieces come in black and yellow color. It make them looks elegant and beautiful with glossy touch. Made from best quality of Teak wood, those 24 inch pieces are durable carving product for outdoor game. So you can use it at beach, garden, backyard, villa, campground, hotel garden, and so on. You can left them at your backyard for months without worried about wood damage because those are made from the strongest wood in the world. As same as chess game, checker is board game which also use squares board to play. The board is as same as chess board which consisting of the same 64 dark and light squares in alternation on a square board. The player just put checker pieces on the black squares only and move as the checker game rule. A set of checkers consists of 24 checker pieces, 12 pieces are dark and 12 pieces are light. Big checkers usually use for outdoor checkers game. Supported with suit board for the pieces, the outdoor checker can played at interesting outdoor area, such as; beach, villa, backyard, garden, campground, school, hotel, and many more. Use the durable checker set for outdoor game. Wooden checker that made from Teak wood material may become the best choice, because it can placed outdoor for months. Try it! In chess game, the player common play with two color of chess piecea. A set of dark pieces againt the light pieces. The standard chess pieces always use black and white or natural brown as the embodiment of the dark and light chess pieces. The player who moves first is referred to as "White" and the player who moves second is referred to as "Black." Similarly, the pieces that each conducts are called, respectively, "the white pieces" and "the black pieces." Adopted from the basic habit above, the wooden chess pieces in black and white are presented here. 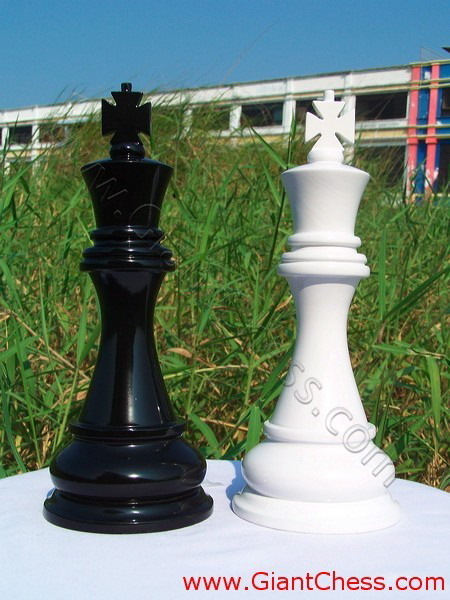 Black and white of King chess are stand outdoor as yard decoration. Its color also add with glossy touch, looks more elegant for decoration need. It's so unique and beautiful as wooden carving products which use best quality of Teak wood as its main material. Classic but cossy. Giant King chess has stand gallant at hotel's outdoor area. By put it at garden, the hotel has interest many people to see and take a picture beside the giant King chess. The giant King chess has become a special interest and it so unique with its different size than other chess pieces. Very durable for outdoor use and safety for children. Has made from best quality Teak wood and polished well in natural brown color. For having outdoor chess game, you should need a set of chess pieces with its board. Outdoor chess game is an interesting game for all ages. So the hotel owner can consider to lay a chess set with its board in outdoor area. Beautiful, natural, interesting decorations are right outside your hotel. Sure that your guests are very happy. Don't think too long, just dressing your hotel yard with giant chess set and the board. The new performance of Pawns pieces for decorate your house. Pawns chess pieces has polished in blue and pastel colors. Many people like to use this marble Pawns for decorate their house and put it at patio area, children room, office, living room, backyard area, dinning room, etc. 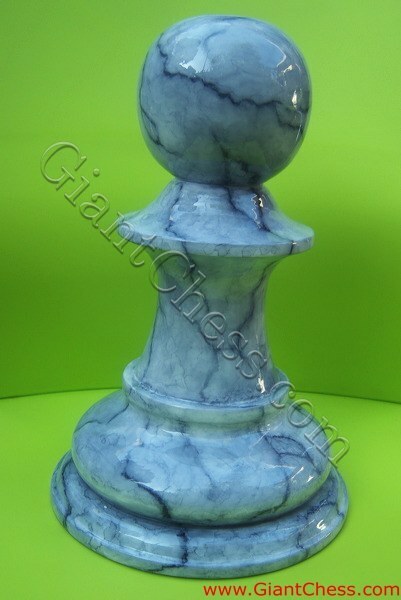 Some people also use it for decorate a room or convention in special occassions, because the marble chess pieces are so unique and so beautiful. 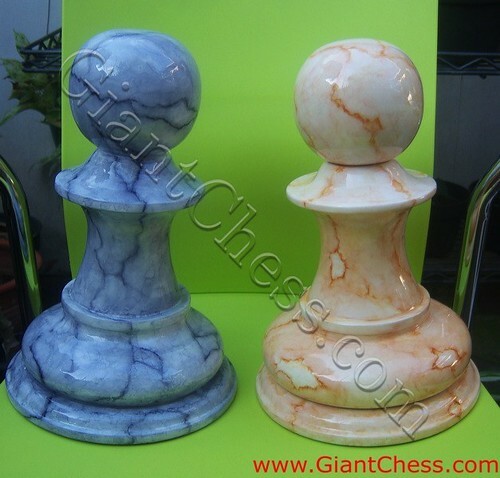 Pawns chess pieces in marble polish are the real beautiful carving products. It also carved in big size by talented craftsman who finished it in such beautiful chess. 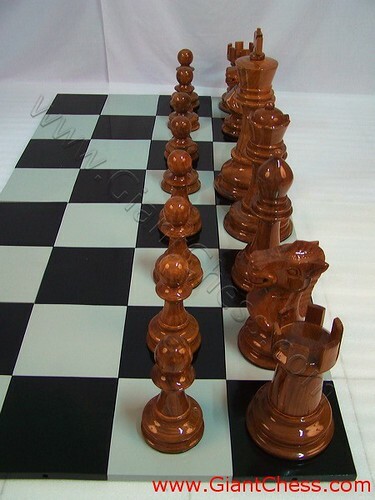 Those marble Pawns are made from best quality Teak wood which has been processed in dried process. By this strongest wood material, people cab use it outdoor without worried about the wood damage. Try it!